Having missed the last Homage2Fromage event I was really looking forward to the latest event for the increasingly popular Leeds cheese club. It was also the first time I'd taken Jane along, and I was a little nervous that she might find things a bit too cheesy. The theme this month was Italian cheeses, and as we climbed the stairs at The Adelphi we could smell wonderful wafts of cheese drifting down to greet us. 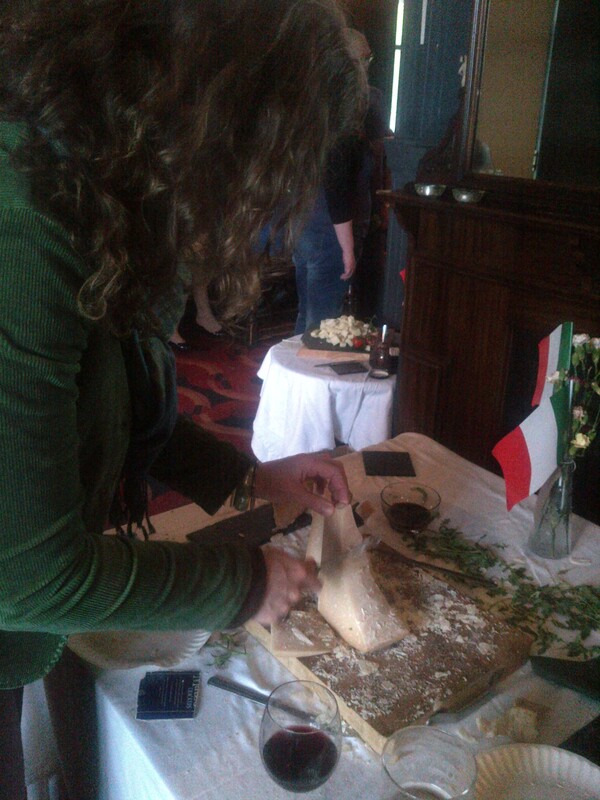 Parmigiano Reggiano PDO - two great wedges of Parmesan were on one of the tables, with various implements to carve, slice or dig pieces from them. A fantastic cheese, it deserves a place on any cheeseboard rather than just being used as a topping for other dishes. Pecorino - I'd tried Pecorino many years ago and wasn't that keen, but trying it again I found it was a fabulous cheese, with a real salty kick. Gorganzola - a great tasting, creamy blue cheese. Nick's description of how Gorgonzola was created by a "careless youth being distracted by a young woman, and left a bundle of his moist curd hanging on a hook overnight" would have made Finbarr Saunders proud. 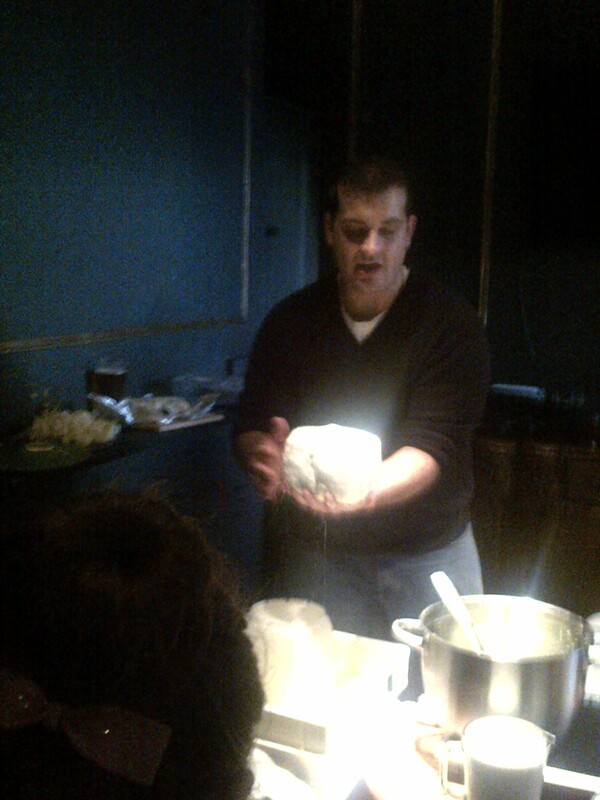 The star of the evening wasn't a cheese though, it was Mario Olianas with his live cheesemaking demonstration. 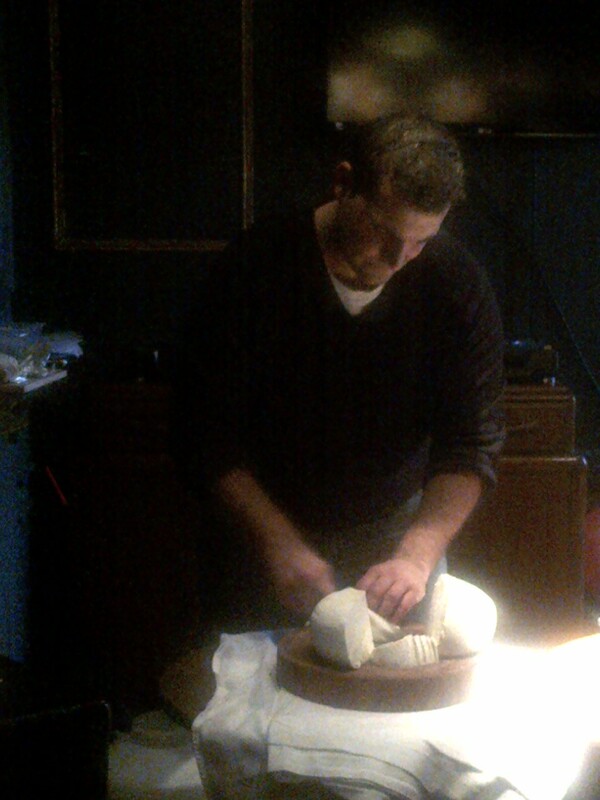 A Sardinian who's been based in Yorkshire for the past decade, his passion for great homemade cheese – and Italian food in general - was totally infectious. Whilst we'd been eating he had been tending to a vat of milk and rennet. 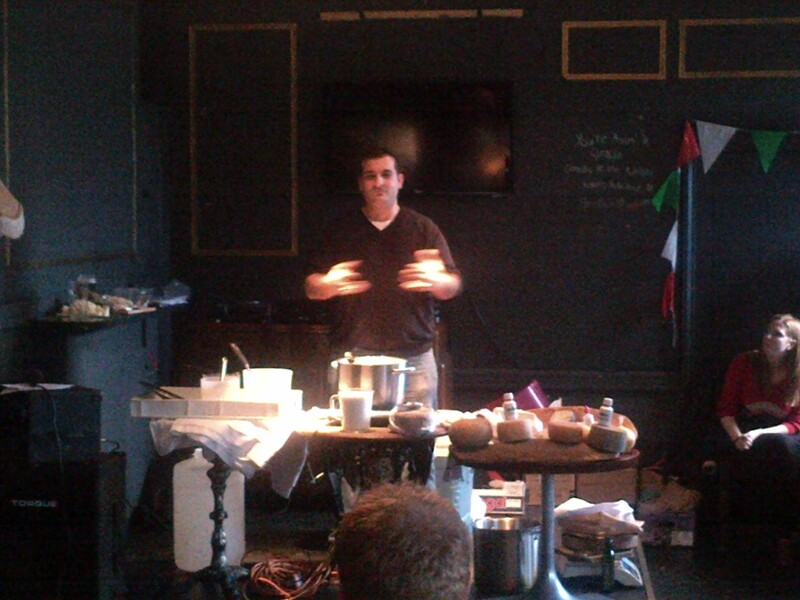 Mario talked about the various types of rennet that can be used to make cheese, and the different flavours each will give to the cheese. He explained that the milk was heated to around 32 degrees, and how varying the temperature would give a different texture to the cheese. He then strained the curds, and pressed them into a mould. 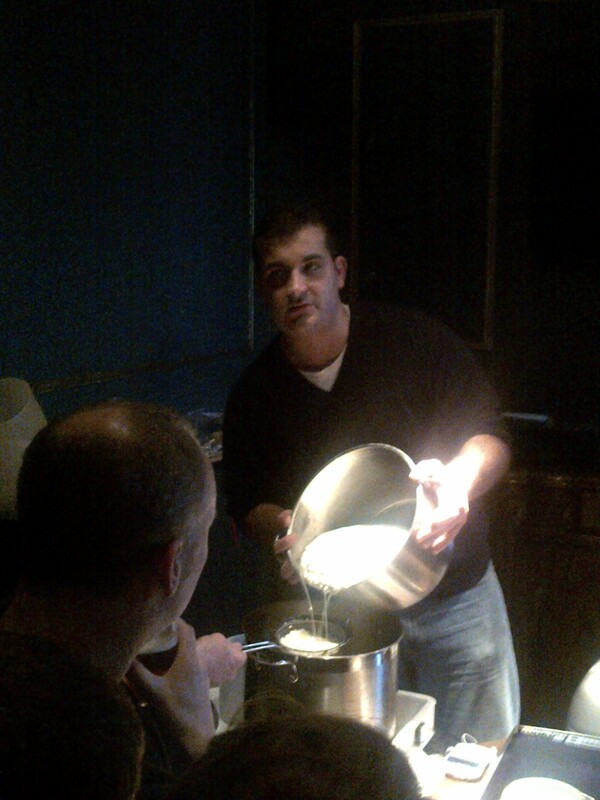 As he talked he continued to turn and press the cheese to squeeze out the rest of the whey. After a few minutes he had a great looking round of cheese. As a final step he rubbed salt onto the outside of the cheese. Normally the cheese would be left overnight or longer to continue to dry, but it still looked and tasted fantastic. Mario then took the whey that had been drained off, heated it to around 95 degrees and - after we'd had a brief interval to grab another drink - scooped off the curds that formed to make a delicious ricotta. All in all another great evening, credit to Vickie and Nick for organising everything. Having tried making my own goats cheese last year I felt inspired to try making more cheese myself. My fears that Jane wouldn't enjoy it were unfounded - she summed up the evening perfectly - "I've expanded my horizons, and expanded my waistline". Say no more.